Central to the mission of the modsnake project is the development of novel gaits, cyclic inputs on the joint angles of the snake robot whose internal motions provide a net displacement in a desired direction. We have developed several gaits described by a small set of parameters, described below. Although we make no claim to the full generality of our gait model, we have been able to mimic all biological gaits and develop those that go beyond biological capability. Sine waves are sent through the length of the snake robot, propelling it either forwards or backwards. Linear progression may be used in tandem with bending or turning motions to navigate space. This gait is particularly suited for fitting into tight areas, such as in pipes or through chain link fence. Sidewinding was inspired by sidewinding biological snakes, and is currently one of the fastest ways for these snake robots to travel. One vertical and one horizontal sine wave interact to locomote the snake sideways. Sidewinding the front half of the snake to the right, and the back half of the snake to the left has the effect or spinning the snake robot in place. This gait is ideal on rugged or uneven terrain. 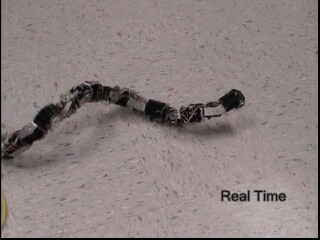 A unique gait, corkscrewing, causes the snake robot to spiral its body, and propegating these spirals back through its body, propelling it forwards. It is useful for traveling forwards or backwards in the presence of obstacles, when linear progression cannot easily propel the robot. Corkscrewing is also valuable when manuvering through a small hole in a wall or a chain link fence. Rolling is a quick and reliable way to move the snake robot sideways. The snake curves slightly into a 'C' shape and then rolls sideways. Rolling is also one of our most energy efficient gaits, since the snake's momentum is conserved. It is useful for uneven terrain and excels at climbing hills. Provided the snake is housed in a waterproof skin, the snake robots are able to traverse the top of the water. Since the robot is buoyant, sending sine waves backwards through the body of the robot propels it forward. The snake is also able to turn. 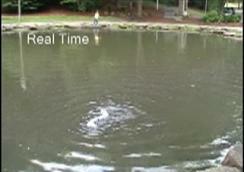 Swimming with wireless control is more efficient since drag from a power line is not an issue. Channel climbing is a variant of linear progression, where the amplitude and period of the sine wave are adjusted to fit the chosen channel or pipe. Channel climbing snake robots are often fitted with a protective skin or rubber to provide additional friction and compliance. No adhesives are used to achieve snake robot channel climbing, only outward pressure provided by the sine waves. 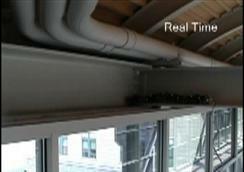 Similar to channel climbing, the snake can also climb up the inside of pipes or tubes. The snakes can climb tubes as small as they will fit into, and research is underway to allow them to climb pipes 8" in diameter or wider. A variant of linear progression can be used to climb a pipe or tube, as in a channel, but since a pipe is cylindrically symetrical, the snakes can also use a modified version of corkscrewing to climb a pipe. Since corkscrewing up a pipe uses all 16 servos, as opposed to just 8 as in linear progression, corkscrew climbing is faster (15 ft/min vs 12 ft/min with Hercules in 4" PVC pipe). Pole climbing refers to moving upwards on clylinders whose perimeter is less than the length of the snake robot. 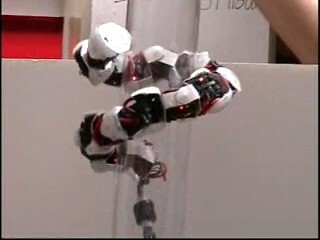 The robot moves upwards without the aid of any adhesive by spiraling its body around the pole, gripping it, and using the rolling gait to travel up or down the pole. 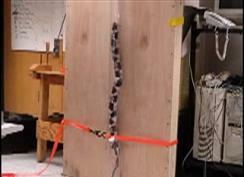 Snake robots are able to transition directly from another gait to pole climbing. Cornering is a motion to maneuver around tight corners, such as those encountered in pipe systems or at the intersection of ibeams. A bend in the snake matching the bend of the corner is generated, and the bend is maintained relative to the corner as the snake moves forward. Once the snake robot�s body is around the corner, the bend is removed. 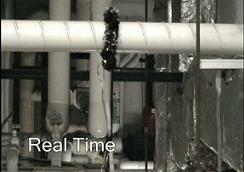 Pipe rolling moves the snake robot efficiently & reliably across the top of a pipe. 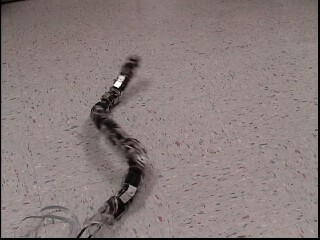 The snake robot wraps its head and tail around the pipe and uses the rolling motion to move forward. Stability comes from its relatively low center of gravity and balance on the pipe and the energy efficiency originates in the energy efficiency of the rolling gait. Many tasks cannot be completed solely by executing a parameterized gait. These cases arise due to task complexity and robot hardware limitations such as size and motor strength. Scripted gaits are developed specifically for the robot to complete a desired task. 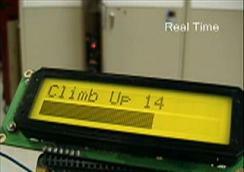 Examples of such tasks include stairclimbing, gap crossing, reaching into a hole in a wall, railroad track crossing, and camera scanning with the head of the robot. 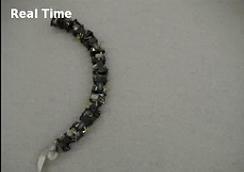 Copyright 2008 Biorobotics Lab, Carnegie Mellon University. All Rights Reserved.